There are no major economic reports in Japan today but the US will publish Crude Oil Inventories, Revised Unit Labor Costs q/q, Revised Nonfarm Productivity q/q and ADP Non-Farm Employment Change. The support rests at 111.810 with resistance at 112.590 which the weekly pivot point at 111.960 is located in between the lines. 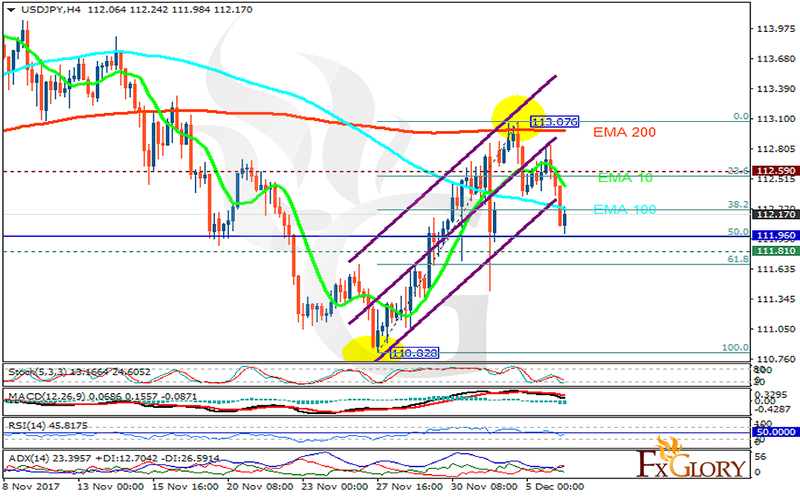 The EMA of 10 is moving with bearish bias in the ascendant channel and it is below the EMA of 200 and above the EMA of 100. The RSI is rising towards the 50 level, the Stochastic is showing downward momentum and the MACD line is below the signal line in the negative territory. The ADX is showing sell signals. Indicators are showing mixed signals. The price may decline towards the 61.8 level of Fibonacci and later start its growth towards 113.